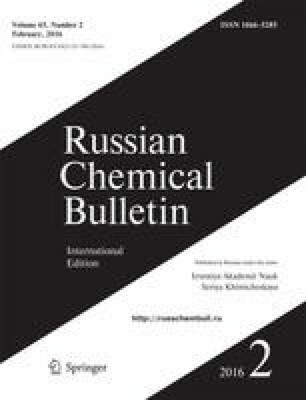 New ruthenium and osmium carbonyl clusters with 1,3,5-triaza-7-phosphatricyclo-[3.3.1.13.7]decane and 3,7-diacetyl-1,3,7-triaza-5-phosphabicyclo[3.3.1]nonane ligands were synthesized using Me3NO as an initiator. The data on antiproliferative activity of new compounds against ovarian carcinoma cell cultures A2780 (cisplatin-sensitive) and A2780cisR (cisplatin-resistant) are reported. The dependence of cytotoxicity on the number of phosphine ligands was demonstrated. Dedicated to Academician of the Russian Academy of Sciences N. S. Zefirov on the occasion of his 80th birthday. Published in Russian in Izvestiya Akademii Nauk. Seriya Khimicheskaya, No. 2, pp. 0546—0549, February, 2016.